Up until recently I haven't been much of a craft beer hunter. The craft beer I drank would either come from a brewery tap or my local craft beer store. I would keep my ears open for any special releases through my craft beer stores social media (facebook, twitter, etc. ), but wouldn't go to any great extent to get my hands on a specific beer. Usually I would be unable to get my hands on any of the special releases due to limited availability and timing. This did not bother me too much, the beer that I drink was flavorful and delicious so I didn't have any issues drinking the local releases. The first time I ever went bottle hunting was for Bell's Hopslam. I was told bout it from a friend and so I kept my eyes out and made a few calls to the local beer stores. I thought I wouldn't find any so I enlisted my friend Frisk, who lives around the Kalamazoo area, and he was able to get his hands on a six pack of Hopslam fairly easy since brewery is based in Kalamazoo. On top of that, I was fortunate enough to land a six pack of my own by calling around and driving to a couple different beer stores around metro Detroit. Everything came up roses, I was rich in Hopslam. 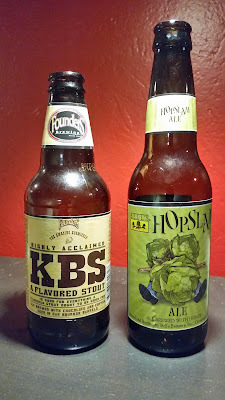 The second time I went bottle hunting was for Founder's KBS. I first tried KBS directly from the tap at the Founder's taproom in Grand Rapids, MI. I wasn't fully able to enjoy this beer since I was coming from the Winter Beer Festival and was a wee bit intoxicated. I enjoyed it enough to know that when it came available I wanted a couple bottles to enjoy in the comforts of my own home. Again, I made the rounds of phone calls to the local beer distributors and hit pay dirt at the Hilton and 9 Mile Market. I could only snag two bottles of it because there was a purchasing limit of 2 bottles per customer. I wish I was able to find more, but I was able to enjoy one bottle and cellar the second. In order to improve my craft beer game I joined two Facebook communities centered around craft beer. That includes bottle trades, limit release notifications, spotting bottles at different stores, and sharing reviews. This is where I found out that my craft beer game is now where near on the same level as many of the people in these groups. I didn't release how crazed people could be until Black Friday. This Black Friday Goose Island Brewery in Chicago released their Bourbon County series. 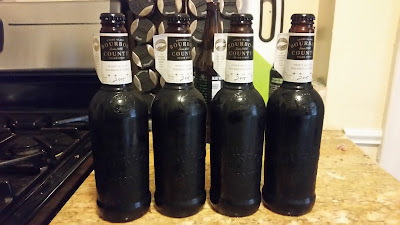 The Bourbon County series seems to be one of the most sought after beers. There are multiple variants (Stout, Coffee, Barleywine, etc.) and some are harder to find then others. Some can only be purchased in Chicago or at the brewery. Through the facebook groups I saw people standing in line on Black Friday like you see people do in front of Best Buy. I was amazed at the dedication of these people just to get a beer. I had to figure out what all the fuss was about. Thus started my third bottle hunt. This one proved to be much harder then the previous two. I made some calls to the local beer stores and they had all sold out already. My go-to craft beer store, 8 Degrees Plato, played it a little differently. They had a limited amount and so they released the bottles starting at 7AM December 1st. I would have gone and waited in line, but it was my first day on my new job and I didn't want to be late. Later that week there was a tip posted on one of the forums about a couple pallets at a Whole Foods in Chicago that were still available. I wasn't about to drive to Chicago just to pick up a beer. That is when I got a great idea. One of my college buddies lives in Chicago with his wife and is a craft beer fan and homebrewer too. He was also unaware of the stigma behind Bourbon County series. I knew he would be back in the mitten for the holidays so I asked if he could track down a couple bottles for me. He went to a Whole Foods and the worker told him that an entire pallet was sold in 9 minutes. They had 3 bottles left but were only able to sell him 2 bottles at a time. Thankfully, before he left for the holidays he was able to track down 3 more bottles. He had to visit 3 or 4 more stores before he found them. Of course he had to try one of them, and said it was worth the hunt. Hunting for one of the Bourbon County beers can get a bit ridiculous. I have heard of people finding bottles of these beers through out metro Detroit at prices from $10 to $60. $60 for a 16 oz. bottle of beer, that is a bit crazy too me. Just the other day I was going to buy a beer and the cashier said, just so you know the beer is $45. I immediately decided that it wasn't worth while and put it back. Being a craft beer enthusiast can get pretty pricey, but I don't think any beer is ever worth that kind of price tag. These three instances are the only times I have gone out of my way to find a beer, of course I have visited specific spots in hopes of finding a beer or asking a friend to pick a bottle or two up for me (I did this for Bell's Planet Series beers). I'm not sure if I will ever get more involved in bottle hunting or bottle trading, but for all those that enjoy this aspect of craft beer I say good hunting.